As customer reviews become more and more common on ecommerce sites, we can expect innovations to emerge in design, usability and quality. It’s always a good idea to keep an eye on Amazon for usability innovations. Today we’ll look at an example of how Amazon helps customers filter product reviews when there are literally hundreds of them. Not only does Amazon help customers hone in on specific types of reviews, it also takes the opportunity to show relevant merchandising based on the customer reviews themselves. In this post I’ll also suggest something that Amazon isn’t doing yet that could help you save sales when review content actually discourages a customer to purchase the item in question. 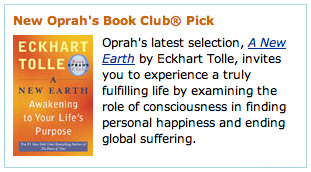 I’m going to use the example of a book that’s going to be a top-seller on Amazon simply because it’s endorsed by perhaps the most influential television personality in the world – Oprah Winfrey. Most people will not feel the need to read reviews because they trust her opinion so much. Others will be so excited about the book they will read the reviews just to tide them over until the book arrives at their door. Then you have the customer who will want to read reviews from people like them to determine whether they want to invest 10 hours of reading and $15 in a book. The question they want answered is “why shouldn’t I buy this book? Amazon’s 5-star rating graph shows that the majority of reviewers are thrilled with the book. But there are over 50 people who gave it the lowest rating of 1 star. With one click, you jump directly to the critical reviews. Not only that, but by default the reviews appear in order of most helpful as voted by other shoppers. (Users can also sort by most recent review). So let’s assume the customer is dissuaded by these comments and will not convert on this item. On the plus side, you’ve provided a great service to the shopper and that’s great for building trust. The customer might prefer you over other sites now for future purchases. But you don’t want this customer to leave empty handed. You must show them reasonable substitutes, and Amazon’s got that covered. Along the right hand side of the customer reviews section, you’ll see product thumbnails and links suggesting other items mentioned in the customer reviews. One problem is this is easy to overlook – like banner blindness, we may also suffer from cross-sell blindness. Another problem is it isn’t clear why the products were mentioned. 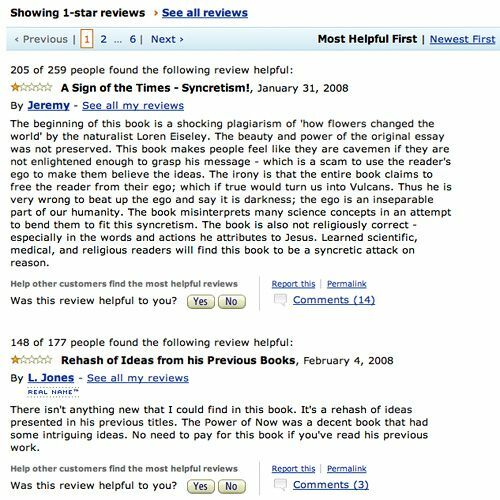 In the image above, we see one reviewer felt this book ripped off an earlier work, and the second suggests if you already own other books by this author, you don’t need to spend money on the latest publication. It’s possible these would show up as cross-sells, but without knowing the context of an item’s reference in a customer review, it’s not as helpful as if these suggestions were organized differently. Include a field in customer reviews that asks “Didn’t like this product? What would you recommend instead?” The review engine should recognize a 1 or 2 star review and pull data from this field, or simply recognize that if the field is filled in, the reviewer was unhappy with the item. And when customers then view the filtered results for 1 and 2 star reviews, they would be shown “People who don’t recommend this item would rather buy” suggestions. This way, you build a tremendous amount of trust, you harness the potential of user generated cross-sells and you increase your chances of converting today. If you missed our merchandising webinar with Mike Svatek of Baynote, do check out the replay and the companion blog summary – it covers a lot of other cross-selling tactics from Amazon. You’ll also want to check out our post on cross selling dos and don’ts. Next articleSocial Commerce on Product Pages – Why Not?